For half a second, this was "just" another downy woodpecker. But look at that clean white feather at the edge of the tail. 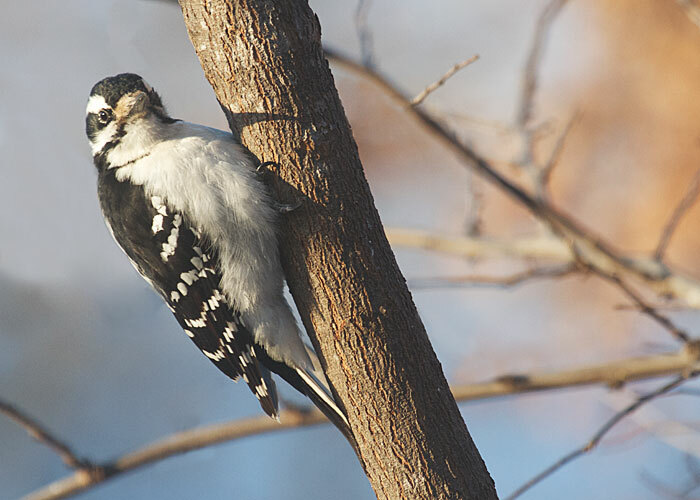 Downy woodpeckers usually have black spots there. Let's look at the length of the beak, and see whether it's a dagger (like a hairy woodpecker has) or a cute little pointy bump (like a downy woodpecker has). Yeah, the beak is hard to judge the length of when it's pointing right at you. But the side-slanting sun has provided a clue. Indeed, this is a hairy woodpecker in the new rising sun. Her bill is about as long as her head is wide. See the male hairy woodpecker here.